Representatives from Children at Risk, Save the Children, BakerRipley, and HISD gathered at Peck Elementary School on Thursday to emphasize the importance of being prepared when the next hurricane threatens Houston. This entry was posted in HISD: Our Story, News, Weather and tagged Peck ES on May 31, 2018 by HISD Communications. Perched on the edge of a firm green seat, bus attendant Loretta Gallaviz picked up a book and began to read aloud. This entry was posted in District VI - Holly Maria Flynn Vilaseca, Transportation and tagged Peck Elementary School, Peck ES, special education on April 24, 2018 by HISD Communications. A KHOU-TV Channel 11 news report that aired late last month on Peck Elementary School has resulted in a big surprise for the campus and its principal—and some very public recognition on a popular TV show. Ellen DeGeneres, the host of the daytime talk show of the same name, heard about the district’s Homeless Outreach Center there through that broadcast, and her staff reached out to Principal Carlotta Brown to see if they could feature the school on the show. This entry was posted in Achievement/Recognition, District IV - Jolanda Jones and tagged Peck ES on May 14, 2015 by HISD Communications. A KHOU-TV Channel 11 news report that aired late last month on Peck Elementary School has resulted in a big surprise for the campus and its principal—and some public recognition on a popular TV show. Ellen DeGeneres, the host of the daytime talk show of the same name, heard about the district’s Homeless Outreach Center housed there through that broadcast, and she reached out to Principal Carlotta Brown to see if she could feature the school on the show. Tune in to Channel 11 (KHOU-TV) to The Ellen DeGeneres Show at 3 p.m. on Thursday, May 14, to see what happened next—including the big surprise that will help Brown serve her students even better. This entry was posted in Achievement/Recognition, District IV - Jolanda Jones and tagged Peck ES on May 13, 2015 by HISD Communications. Last year, HISD’s Nutrition Services department launched a pilot program at a handful of campuses to increase the selection of fresh fruits and vegetables available to students in the cafeteria at lunch. This entry was posted in Food Services and tagged Bastian ES, Berry ES, Briargrove ES, Burrus ES, Crespo ES, Dogan ES, Frost ES, Gallegos ES, Garcia ES, Garden Oaks ES, Golfcrest ES, Gregory-Lincoln Education Center, Herrera ES, Highland Heights ES, Isaacs ES, J.P. Henderson ES, Lantrip ES, Lewis ES, Oates ES, Osborne ES, Peck ES, River Oaks ES, St. George Place ES, Tinsley ES, Travis ES, Whittier ES on November 17, 2014 by HISD Communications. In honor of National School Bus Safety week in October 2013, the HISD Transportation Department created a music video that covered such topics as proper boarding procedures, how to sit on a bus and the importance of reporting bullying. Students from Peck Elementary School, Yates High School and the High School for the Performing and Visual Arts were included in the video, along with district bus drivers and attendants. The district’s multimedia team filmed the video. The video has received more than 38,000 views on YouTube. 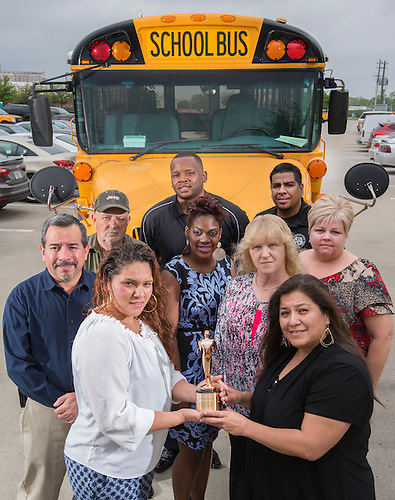 This entry was posted in Transportation and tagged HSPVA, Peck ES, Telly Award, Yates HS on April 8, 2014 by HISD Communications.